The Vanishing American is a silent film from 1925 that explores the tragic plight of Native Americans trapped by history and fate, and who ultimately become crushed into non-existence by the grinding wheels of racism and modernity. The source material is the novel by the same name written by Zane Grey. The film was good enough I am thinking of maybe running down the novel and giving it a read. For a film of its time The Vanishing American is uncompromising on all fronts. It pulls no punches whatsoever. If you can look past the fact the main character of Nophaie is played by the white Richard Dix (a not uncommon occurrence, sadly, even today) the film and the story are strong enough to make a real impact. I don’t want to spoil too much, but the film looks at the Native American down through history up through WWI. We see how Nophaie and his people are abused by government and institutional racism. But the film makes a stand here, too. 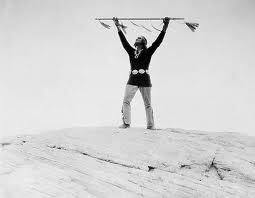 It does not portray the Native Americans as “strong, silent and noble savages” which itself is diluted racism. No, it shows them as human beings who are oppressed by more human beings. The film doesn’t preach, though to be sure there is a message here — and a strong one. For me the power of this film, like I said, comes from the harsh light that shines on the institutional racism. At one point an Army sergeant watches Nophaie and his people march off to take part in a war that has gripped the world. He says they are “pitiful and magnificent” for going off to fight a “white man’s war.” Nophaie hopes by taking p art in fighting for a country that has usurped his own culture, he will gain political and social favor and win a white woman’s love. When he returns, he must face the ugly truth. Meanwhile, the white woman he has fallen in love with has waited patiently for his return. She loves him in return. 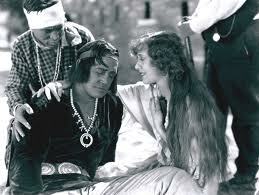 But, since this is a film from 1925 there is no completion of their love. Nophaie dies in a tragic accident during a clash between his people and the Indian agents of the reservation. The Vanishing American is not a perfect film about racism. Nor is it meant to be. But the voice it lends and the dignity it gives to the story and the human hearts involved in this story cannot be denied. I definitely recommend this film, especially for western writers and people who love a good human story. Its pretty strong, and worth the time.